Cup Saucer Plant is a shrub with spreading branches. Its striking feature is it fruit, which looks like a berry kept on a saucer, or a cup kept on a saucer to many. The common names of this plant originate from this. It is a small shrub, 2 m, with spreading branches. 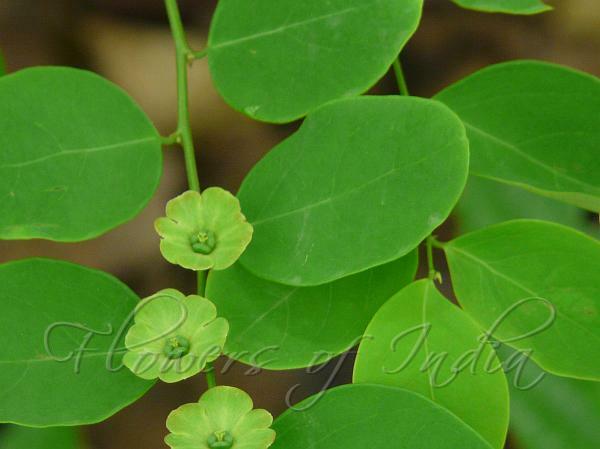 Alternately arranged leaves, 1-3 cm, are broadly elliptic, obtuse, with a rounded tip. Flowers are unisexual, in leaf axils, on filament-like peduncles. Male flowers 1-3 fascicled, yellow; female green; sepals 6, round; styles 3, divided into two. Fruits, 1-2 cm, are slightly flattened round berries, red, with much enlarged calyx which looks like a saucer.